The Fall City Metropolitan Park District was voted in by area residents on February 3, 2009 to represent local interests for park and recreation services. The park district represents a specific geographic area similar to that of a fire, school, or water district. As of February 2009 there were 3,775 registered voters within the Fall City Park District. The FC Park District Commissioners have developed the District's vision, mission, and 'big picture' goals for the District. Specific short and long term goals will form the foundation for the district's future for parks as well as form the basis of a fiscal budget and corresponding levy rate. The adopted Comprehensive Plan for 2010 - 2015 has outlined the direction for the Park District. A review of this current plan is underway that incorporates input received, takes into consideration the issue of levy prorationing, and makes modifications as appropriate. A copy of the draft Comprehensive Plan for 2014 - 2019 is available for review and comment. Public input is very important as priorities and the future direction of the district are refined. More information and access to the adopted and draft Comprehensive Plans are available on the Fall City Metropolitan Park District website. Many of us in Fall City have seen traffic volumes increase along SR 202 - concerning for our residents, and children who walk along the roadway shoulder from neighborhoods/schools into downtown. 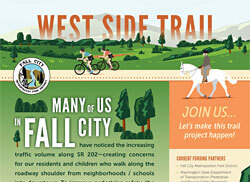 To improve safety, the Fall City Metropolitan Park District is in preliminary design of a proposed separated trail to be located on the south side of the SR 202 (SE Redmond Fall City Road). More information on this exciting project are available on the Fall City Metropolitan Park District website. Photos on this site property of Fall City Community Association unless otherwise noted. PLEASE - USE PHOTOS ONLY WITH PERMISSION. Many thanks to all who donate the use of photos on this website, with special thanks for Alan Bauer for most of the page banners as well as many other of the photos.